Some people say their love affair with photography came when they first picked up a camera. It didn’t happen that way with me. I had been idly making snapshots with my first 35mm camera — a Pentax — for months before I felt a moment of magic, and that happened not with my eye in a viewfinder, but with my hands in a tray of developer. I fell in love with the print. The first time I saw an image form on a piece of wet photo paper I was hooked. Even though that first image only lasted seconds before it turned black (because I had overexposed it in the enlarger), that we enough. When I shot film, I came to live for the print because the print enabled me to see the image I’d made. Later, as I switched to digital I realized I didn’t need the print to experience the excitement of the image. There it was, on the computer, large and vibrant. I still enjoyed the “darkroom” work — enhancing contrast, extending tone, shaping color — but now the darkroom was dry and digital instead of damp and chemical, so I stopped printing. 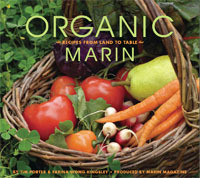 I have a show this week of photos I made in connection with a cookbook I wrote and photographed about organic food from Marin County (Organic Marin, Recipes from Land to Table, Andrews McMeel, July 2008). It is a small show — 13 photos (one of them is above) — and is part of a month-long arts salon put on by Marin Magazine, which I do a lot of photography for, and a local home decor showroom. At first, I was reluctant to do the show. Digital printing is dicey, at best, these days, with quality varying from printer to printer; and framing is expensive. But with some trial and error, I found good people to do both (Alesha Rogness at Vivid Imaging in Sausalito, 415-331-8272, and Bob Woodrum at Sausalito Picture Framing) and when I saw the finished prints, 20 x 30 and framed, that old excitement returned. I’ve learned to loved the print again. 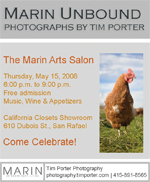 The show is up this week at California Closets Showroom 610 Dubois St., San Rafael. The party is Thursday, May 15, from 6-9 p.m, free music, snacks and wine. C’mon by if you can. 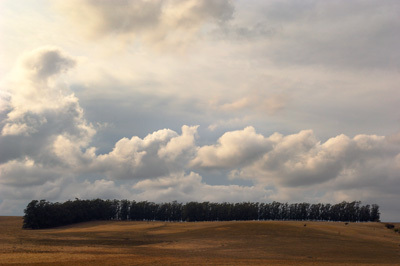 This entry was posted in Personal and tagged Andrews McMeel, California Closets, digital printing, Organic Marin, Photography.